I had a day out with my friend yesterday, it did involve lunch which included a divine Gingerbread Chocolate Fondant served with toffee sauce and vanilla icecream in a tuille basket - it was to die for! I didn't take a photo (sorry). However, my DH went shopping for something for our meal today and came back with tuna steaks. Now I do love fish, but I have never really liked fresh tuna, so not something I would have bought. Anyway I thought I should give them another go and looked for a gutsy flavoured recipe that would allow the tuna flavour to come through but not be the only taste. I've never really been good on oily fish. I found this Tandoori Tuna recipe in my Good Housekeeping Cookery Book, it involved marinating the tuna for a few hours in a homemade Tandoori paste. Then simply cooking it in a hot pan for for a few minutes and leaving it to rest for another 5 minutes. 1 Wash and dry the tuna steaks and place in a shallow dish. 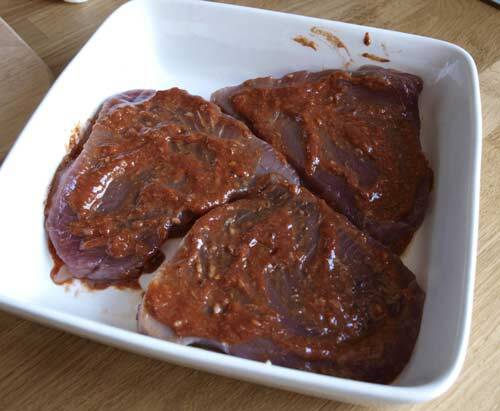 Mix the tomato paste with the oil, lemon juice, giner, garlic, coriander, chilli powder, cumin and 5ml (1tsp) salt. Spread the mixtue all over the tuna steaks, ocver and leve to marinate in a cool place for 2 hours. 2 Meanwhile make the raita. Combine all the ingrfedients in a bowl and seaon with salt and pepper to taste; set aside. 3. Brush a griddle or heavy-bsed frying pan with a little oil and place over a ghigh heat. When hot, add the tuna steaks and cook for 2 minutes, then turn and cook the other side for 2 minutes. Remove from the pan and leave to rest in a warm place for 5 minutes. 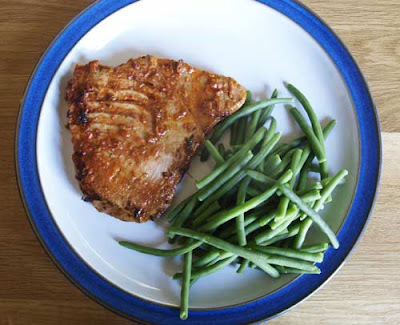 The recipe suggests serving with naan bread and aubergine chips, but our tuna steaks were so large, we just had french beans with the tuna and raita. I really enjoyed it and would definitely make this again. My colleague keeps telling me I should try fresh tuna; I don't know why I've been so wary of it, cos this dish looks gorgeous! I'll have to take the plunge and give it a try. That looks fantastic Janice... I must try that next time I spot tuna for sale. I've never tasted something like this tandoori tuna!